Idared is an attractive late-season American apple, with a mild flavour, useful for both eating fresh and cooking. 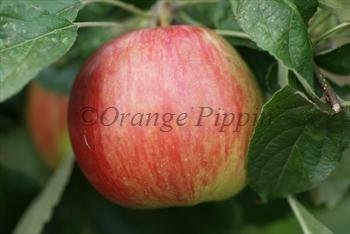 Idared is also an excellent apple for juicing, a quality which is inherited by Fiesta, one of its descendants. Idared has exceptional keeping qualities, and can be stored in a domestic fridge for at least 6 months. Please fill in the details below and we will let you know when Idared apple trees are back in stock. This russet apple is also related to Idared. Fiesta is related to Idared, and shares its excellent juicing and keeping properties. Idared is in flowering group 2. Idared is self-sterile and needs to be pollinated by another tree of a different variety nearby. Idared has some susceptibility to mildew but is generally an easy variety to grow, but is likely to do better in the drier eastern side of the UK. It is fairly precocious and usually a heavy-cropper. The blossom has some frost-resistance. Developed at the Idaho Agricultural Experimental Station, 1930s. Idared is a cross between Jonathan and Wagener.